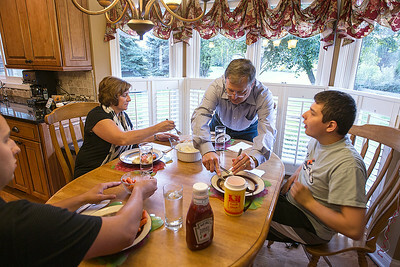 Kyle Grillot - kgrillot@shawmedia.com Dianne and Ken Diana help their son Andrew (right), who has nonverbal autism, during dinner with her family, including her son Kenny (left), on Wednesday, August 27, 2014 in Crystal Lake. Like a lot of Illinois families with children with intellectual and developmental disabilities, the Dianas have had trouble finding services for their son, Andrew, who they had to send to Kansas City for school because they couldn't get the services he needs here. The Pioneer Center is trying to get Andrew into one of its in-the-works group homes now that he has aged out of the school he went to in Kansas City. Kyle Grillot - kgrillot@shawmedia.com Dianne Diana helps her son Andrew, who has nonverbal autism, after dinner on Wednesday, August 27, 2014 in Crystal Lake. Like a lot of Illinois families with children with intellectual and developmental disabilities, the Dianas have had trouble finding services for their son, Andrew, who they had to send to Kansas City for school because they couldn't get the services he needs here. The Pioneer Center is trying to get Andrew into one of its in-the-works group homes now that he has aged out of the school he went to in Kansas City. Kyle Grillot - kgrillot@shawmedia.com Dianne Diana walks with her son Andrew, who has nonverbal autism, after dinner on Wednesday, August 27, 2014 in Crystal Lake. Like a lot of Illinois families with children with intellectual and developmental disabilities, the Dianas have had trouble finding services for their son, Andrew, who they had to send to Kansas City for school because they couldn't get the services he needs here. The Pioneer Center is trying to get Andrew into one of its in-the-works group homes now that he has aged out of the school he went to in Kansas City. Kyle Grillot - kgrillot@shawmedia.com Ken and Dianne Diana watch as their son Andrew (right), who has nonverbal autism, rides his tricycle after dinner on Wednesday, August 27, 2014 in Crystal Lake. Like a lot of Illinois families with children with intellectual and developmental disabilities, the Dianas have had trouble finding services for their son, Andrew, who they had to send to Kansas City for school because they couldn't get the services he needs here. The Pioneer Center is trying to get Andrew into one of its in-the-works group homes now that he has aged out of the school he went to in Kansas City. Kyle Grillot - kgrillot@shawmedia.com Dianne Diana helps her son Andrew who has nonverbal autism during dinner with her family, including her son Kenny (left), and husband Ken, Wednesday, August 27, 2014 in Crystal Lake. Like a lot of Illinois families with children with intellectual and developmental disabilities, the Dianas have had trouble finding services for their son, Andrew, who they had to send to Kansas City for school because they couldn't get the services he needs here. The Pioneer Center is trying to get Andrew into one of its in-the-works group homes now that he has aged out of the school he went to in Kansas City. Ken and Dianne Diana watch as their son Andrew (right), who has nonverbal autism, rides his tricycle after dinner on Wednesday, August 27, 2014 in Crystal Lake. Like a lot of Illinois families with children with intellectual and developmental disabilities, the Dianas have had trouble finding services for their son, Andrew, who they had to send to Kansas City for school because they couldn't get the services he needs here. The Pioneer Center is trying to get Andrew into one of its in-the-works group homes now that he has aged out of the school he went to in Kansas City.